Image caption Young stars eject massive amounts of material into the surrounding "interstellar medium"
Relatively complex, carbon-containing molecules are found in comets and on nearby planets, thought to have been made elsewhere in our Solar System. 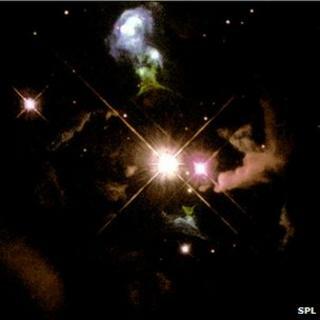 But a report in Nature suggests even larger molecules may be forged near young stars and flung outwards. The find adds to a large body of often conflicting evidence about the origin of our Universe's complex molecules. The team behind the work says that "stellar organics" may have been delivered to the early Earth, but that suggestion remains to be confirmed by future observations. Much of the chemistry that happens elsewhere in the cosmos remains mysterious, leaving astronomers to guess how nature assembles molecules. It has until recently been assumed that fairly simple molecules could be assembled in the areas around young stars, while more complex materials form in cooler conditions. Adding to the mystery, though, have been "unidentified infrared emissions", or UIE, emanating from a range of sources in our galaxy and beyond. This infrared light must come from molecular vibrations - the waggling of one atom relative to another within molecules that have absorbed light of higher frequencies from other sources. Light in the infrared is then emitted as the wagglings die out. Like the strings of a piano, each molecular vibration has its own note, but the unidentified infrared emissions are a rich, dense "chord" of notes that makes the nature of the emitting molecules extremely difficult to unpick. Since the late 1970s, astronomers have been making guesses about what the molecules may be; most recently, they have been assumed to be polycyclic aromatic hydrocarbons (PAHs) - linked rings of carbon dotted with hydrogen atoms that on Earth are known to be powerful and toxic pollutants. While these molecules forged near new stars are relatively complex assemblages of atoms, they are not as intricate as molecules that have been spotted elsewhere in the cosmos. "Complex organics have previously been found in the Solar System - in meteorites, in comets, and on planetary surfaces [such as that of Saturn's moon] Titan," Prof Sun Kwok of Hong Kong University told BBC News. "However, the traditional view is that these organics are made in situ in the Solar System." Using the Spitzer space telescope, Prof Kwok and his colleague Yong Zhang looked at the light coming from nascent stars, along with light from two novas - explosions of white dwarf stars. They then devised a theoretical molecule, changing its structure and parts until its molecular vibrational "notes" most closely matched what Spitzer had seen. Instead of PAHs, the pair's candidate molecule was a rich mixture of the ring-like "aromatic" structures familiar from PAHs and kinked "aliphatic" chains of carbon atoms. "The implication of our paper is that these Solar System organics bear resemblance with the organics that are made by stars, or planetary nebulae," Prof Kwok explained, "and it is possible that the Solar System contains remnants of stellar organics." Rather than some rare and yet-to-be-understood chemistry driving the manufacture of such molecules, the process that sees organic material spewing out of stars may be far more ubiquitous. Recent work in Astrophysical Journal Letters by Rhonda Stroud of the Naval Research Laboratory in the US and her team has shown how both aromatic and aliphatic molecules could be made in the interstellar medium by passing shock waves from supernovas - and that such shock waves could also destroy them. Carey Lisse of Johns Hopkins University's Applied Physics Laboratory agreed, telling BBC News that "while young stars may fling complex organic molecules forged from simpler 'interstellar medium' precursors, it is also just as possible they destroy them, too". "On the other hand, older, swollen red giant stars are certainly expelling thick winds rich in carbonaceous soot and organic molecules, and once they finally blow off their gaseous envelopes and expose their inner, naked nuclear furnaces as white dwarf stars, they irradiate the surrounding rich mix with strong ultraviolet light and process them even further," he told BBC News. That further complicates the picture of how carbon and complex organic molecules may end up travelling into other solar systems such as our own. "The question of whether [complex organics] are made in the Solar System or whether they survive from the interstellar medium is interesting, and it's not clear to me the authors have definitively proven the existence of their suggested species," Dr Lisse said, "but it is interesting that they have re-visited some old fading stars to derive this new interpretation," he told BBC News. "Any evidence we can get of very young and very old stars actually seeding the interstellar medium with complex organics that can for example lead to life is exciting. "The deeper we look, with better and better telescopes and instruments and ideas, the more we find out about our rich cosmos. I am sure this story is not settled yet."